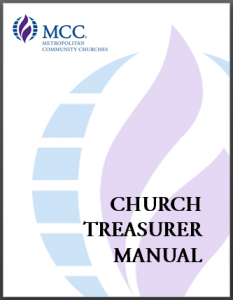 MCC is pleased to announce the release of the new MCC Treasurer’s Manual. The manual was developed through the Office of Rev. Elder Darlene Garner in response to a need expressed during the Church Size Summits. Vickey Gibbs, MCC Curriculum Specialist, worked with four MCC experienced church Treasurers to produce the new “MCC Treasurers Manual” Our thanks to Elisa Vega-Burns (Resurrection MCC) , Marsha Warren (MCC of San Antonio) , Tim Helm (MCC Washington, D.C. and Tracey Kennedy (MCC of Northern Virginia) for their help in creating this 170+ page manual. We also thank Diane Jasso, Phyllis Moore, Tracy Schulz, and Karen Turner for their editing assistance. This manual is for everyone in the congregation who is involved in the financial activity of the church. This might include the Treasurer, Financial Secretary, Finance Committee and the Board. There are many functions of the church that have financial implications: offerings, investments, endowments, loans, grants, personnel, insurance/risk management, and taxes (local, state, and federal). The MCC Treasurers Manual was created to give a general overview in all of these areas and some suggested resources for further information. It is impossible to answer in one place every question that someone might have. However, every attempt has been made to provide basic how-to information and helpful templates. We also have provided links to other sources for more in depth information. We know that each church has its own unique characteristics and this manual should be a starting point for your church to build its own records and systems as you adapt the information for your specific needs. Here you can post your questions and needs and get feedback from other MCC Treasurers and the Office of Emerging Ministries. We also will use this site to share resources, ascertain additional needs that our local Boards and Treasurers may have, and to identify additional resources that can be developed.